Last night Kanin got to live out one of his dreams, playing hockey during an intermission of a St. Louis Blues game. I specifically remember the first time Kanin saw other kids out there playing and him saying, "I want to do that some day". At the time, I didn't realize how or why those kids' teams got "chosen" to play (more on this later) but I always hoped that he would get the chance to do it. Here is a picture from that night. Kanin was 3 years old. When we arrived at Scottrade, Kanin told us that he thought he was going to throw up because he was so nervous. Scott told him, "Don't be nervous. There will only be 18,000 people watching you!" Really nice, huh? Here are the boys heading off to their locker room. 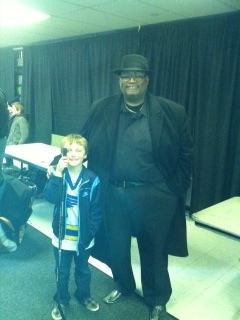 While they were down in the locker room area, Kanin got his picture take with Charles Glenn. Charles Glenn is a very accomplished singer and entertainer and he sings the National Anthem before almost every home game. He has an amazing voice. Here we are before the boys had to leave to go down to get dressed. The St. Peters Spirit Hockey Club, White Team II, took the ice during the first intermission. There is my #22. I love this picture of him with the Blues symbol on the ice. I am so glad that Kanin and his team got to do this. They were all so excited when they got off of the ice and couldn't believe that they were just out there where the Blues actually play night after night. Ok, now for the REALITY of these teams "getting to play" on the ice . . .
All of those years ago when Kanin was dreaming about playing at a Blues game, I didn't realize that it wasn't an "invite" to play it was a "pay to play". 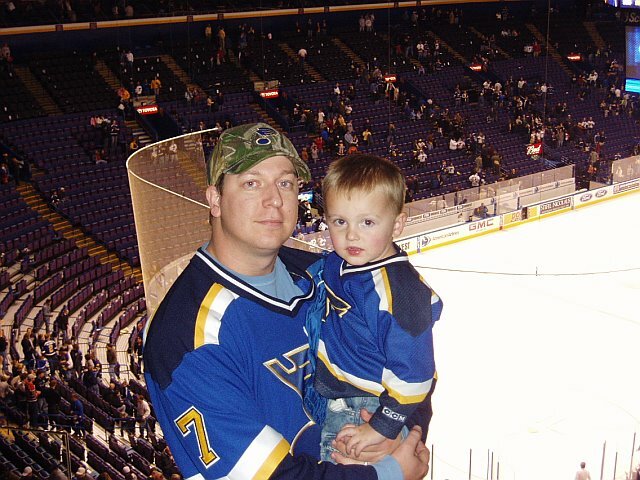 When our coach approached us about playing at a Blues game, all of the parents jumped at the chance. Of course, then we found the "catch" . . . we had to guarantee that we would buy at least 40 tickets at $45 each. Scott and I already have season tickets and thought it was kind of ridiculous that for us to participate we had to buy more tickets but, in the end, we did because we wanted him to have the experience. That part worked out OK because our nephew wanted to go down so he ended up taking our 2 regular seats and we bought 4 (Scott, me, Kanin, and Gracie) with the rest of the group. The game started at 6:00pm and the boys had to be down there and checked in by 5:00. They had to take their stuff to the locker room and then walk all the way over to our seats (across on the other side of the arena). They could watch the opening festivities but had to leave to head back to the locker room 3 minutes after the beginning of the 1st period. Once intermission came, they only played for 3 minutes at 15 seconds. Basically, it took longer to put all of the equipment on than they were out on the ice. After their little scrimmage, they had to go back out and change and then all of their hockey gear had to be taken out to the car immediately. There was no storage area to hold it until after the game. Luckily, Scott thought ahead and we bought a parking garage pass rather than one of the street parking lots so he didn't have to walk as far. Either way, Scott and Kanin arrived back to our seats with about 5 minutes of the 2nd period left to play and then they did get to watch all of the 3rd. Yes, it was worth the money and effort it took for him to have the experience of playing on NHL ice but I'm hoping that it will be a one and done kind of thing . . . is that bad? ha! No that is not bad! =) Totally understandable! So glad your adorable hockey player got to live his dream though! Worth it all!!! Great pictures!! Kanin is seriously the luckiest little kid... Disney World... World Series game... PLaying hockey at Scott Trade. Parents of the Year, for real!! That is so great that he got to do that! He'll look back at that and have that as such a highlight of playing hockey somewhere that most people don't get the chance to do! How exciting for him. That is so awesome! Definitely a memory to last a lifetime. I've read stuff from. Many thanks for posting when you have the opportunity, Guess I'll just book mark this blog.